We are celebrating our 50th Anniversary at Lake Lanier by discounting our 2019 classes by $50! Classes are available all year. If the scheduled weekend classes below do not fit your schedule, please call so we can arrange something that does. Weekday classes are also available. 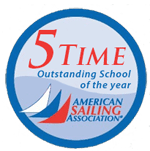 The classes are American Sailing Association certified courses. Included in Price: ASA Sailing Made Easy Text Book $25 value, ASA Log Book $10 value, ASA Testing Fee $12 value, ASA Certification Fee $39 value, Free Four Hour Rental onboard Capri 22’ $300 value and Guarantee to Pass BKB-101 3 Day Course “Priceless”. Included in Price: ASA Sailing Made Easy Text Book $25 value, ASA Log Book $10 value, ASA Testing Fee $12 value, ASA Certification Fee $39 value, Free Four Hour Rental onboard Capri 22’ $300 value. Lanier Sailing Academy “Guarantees” your ASA Basic Keelboat Certification. In the event you do not pass our BKB-101 3-day course within the scheduled course completion date, we will provide additional instruction until you have certified, at no cost to you. (Additional instruction will be available Monday through Friday). We know how to teach sailing! Our instructors are the best!